For true coffee lovers, the caffeinated bliss starts well before the first sip. Enjoy making your coffee just as much as you love drinking it with this manual coffee grinder. 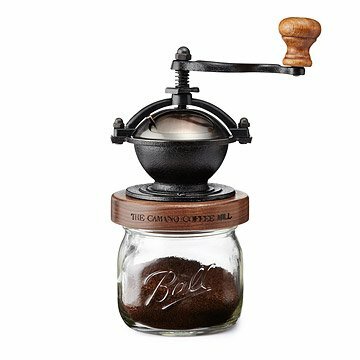 Highlighted by a black walnut lid and cast iron grinder, this steampunk-inspired design holds enough coffee beans to make 4-5 cups of drip coffee. After being grinded, the aromatic grounds settle in a mason jar container, ready to perk you up for your morning routine. Handmade in Biblegrove, Missouri. Husband and Wife, Justin and Britta Burrus, started their company in April 2010. Justin had a construction business along with creating handcrafted gifts, furniture, and signs which Britta would paint and distress, for friends and family. They have added several hand built and quality goods for the home to their line and keep dreaming up other goods to add to the selection. They have similar taste and style when it comes to home decor and enjoy brainstorming new additions. Keep grinder in cool, dry location. Run white rice through grinder to clean. Hand wash jar only. I love the design, look, and functionality of this product!!! It looks awesome, grinds evenly, doesn't use electricity and is quiet unlike my electric grinder. I will probably buy one for a gift soon. This gives better consistency than electric grinders. It is adjustable, and it actually makes the coffee taste better. There is also less waste, as all the beans are ground (if using a coarser grind) and no unusable "powder" created. Incredible craftsmanship! Beautiful. Attention to detail. Wonderful grinder. Thank you! Purchased to grind coffee for French press (coarse) vs drip (medium) and works great. Takes some practice but does exactly what I want and like much better than my electric grinder. Cosmically pleasing as well. Only downside is difficulty in changing the coarseness of the grind and think that will get easier with time and practice. I love the look of this coffee mill and it looks great in my kitchen. It does take a little longer than an electric mill to grind the coffee, but it is worth it. ...and it looks good too! I use a percolator. I get a perfect grind with this grinder. Compact and attractive for the kitchen counter. Looks great on kitchen counter. Enjoy making your coffee just as much as you love drinking it with this manual coffee grinder.